It’s 1972; and the U.S. Senate has finally followed the House’s lead and passed the Equal Rights Amendment, sending it to state legislatures with the hopes of millions of women that the constitutional amendment first introduced in 1921 will soon finally become law. But not all women are totally on board with the burgeoning women’s liberation movement. 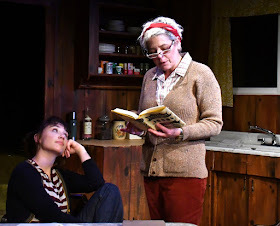 In a captivating play that often seems more like a page-turner novel, Sarah Treem places on an isolated island off the coast of Seattle, Washington an entire range of opinions concerning women’s rights and roles, from ultra-liberated to those bordering on totally traditional; and she does so with only four females and one lone male. Custom Made Theatre Company presents her 2014 Off-Broadway When We Were Young and Unafraid in a production that has the audience leaning in for the entire two hours, careful to grasp every word, grin, and grimace of a cast that to a person creates characters unique and memorable. As they tell a slice-of-life story, hellacious pasts, remarkable revelations and changes, and found redemptions all play a major part in the telling. The play opens with a scene familiar to almost any mother with a teen-age daughter, with bed-and-breakfast owner Agnes trying to convince her sixteen-year-old daughter Penny to ask a particular boy to the upcoming high school prom, a suggestion to which replies the brainy kid in jeans who has her sights more set on Yale than on dating boys, “I can’t think of anything more bourgeois.” As the two continue to have a typical parent/teen battle where no winner can possibly emerge, there comes the sound of a gate click and a bell, with both looking at each other in a knowing and urgent glance. From a trap door in the modest B&B’s kitchen (designed meticulously by Bernadette Flynn with rustic touches from the 50s left over in the 70s) emerges like a fragile butterfly from a cocoon Mary Ann – only this butterfly is marked by a huge facial cut and wound eclipsing half her face. 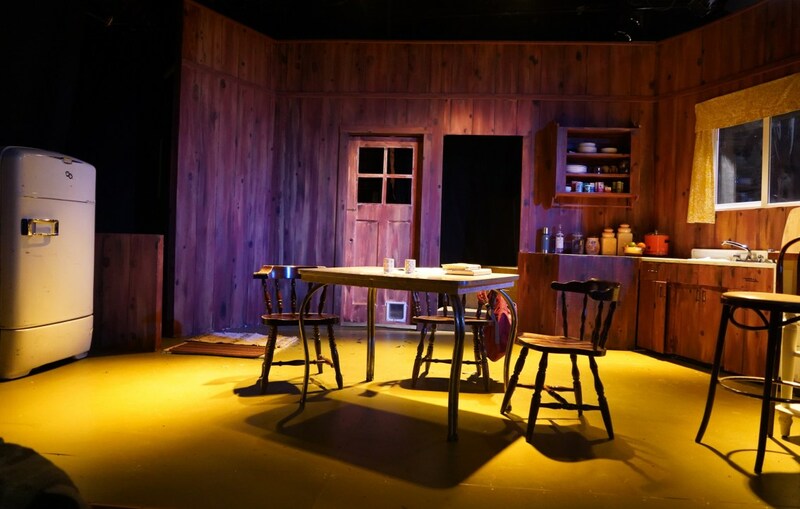 Surprise Number One of the play (to be followed by many more) is that Agnes secretly houses in her B&B desperate women who are escaping their abusive husbands, something she hides from her renting guests. With Mary Ann’s arrival, both she and now fully cooperating Penny move into an evidently much-practiced sequence to console and aid the wounded, scared, trembling victim. Yet one more searcher for a different life lands on the island’s shores as a paying guest at Agnes’ B&B, an escapee from the hippy-infested San Francisco in the form of a squeaky clean, all-around nice guy named Paul. The lanky, big smiling man who still looks like a boy arrives wounded in ways not immediately obvious and looking for someone for whom he can write a love song and sing while strumming his guitar. For each of these characters, back stories still to be revealed will emerge, bringing revelations that lead to their and others’ changes and growth. Liz Frederick is a frightened Mary Ann who has had a dream shattered while still holding on to the fact she loves the man who destroyed that dream while hurting her. 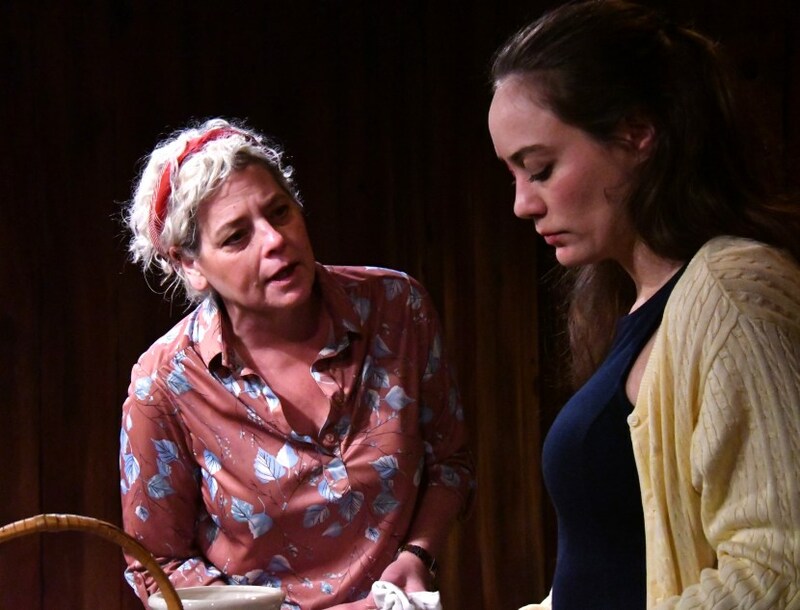 Her Mary Ann is an amalgam of conflicting desires, confusing drives, and alternating timidity and boldness – providing us a heart-breaking yet ultimately inspiring portrait of one abused woman among the many Agnes has helped through the years. Playing Penny, Zoë Foulks is absolutely convincing and altogether believable as a girl who teeters between a excitable, quick-to-pout girl and a young woman with beliefs firm and intentions idealistic. Matt Hammons has a little of Mr. Rogers and some of Barney Fife wrapped into a persona of his Paul that comes close at times to caricature but never crosses that line, leaving us with a guy who exudes trustworthiness amidst a sea of women who eye him – at least in the beginning -- with varying degrees of incredulity, disdain, and fascination. Particularly strong in her portrayal of Hannah is Renee Rogoff. Whether finding herself sitting in the kitchen sink or on the floor with a screwdriver, her Hannah never ceases to be several degrees past graceful and genteel. She moves with a proneness toward bowlegged swagger and asks incessant questions with an approach much like a hammer. But her Hannah has a hiding heart the size of the entire Northwest; and her search for someone with whom to share that heart somehow leads her to return to this B&B, even if it is through the kitchen window. 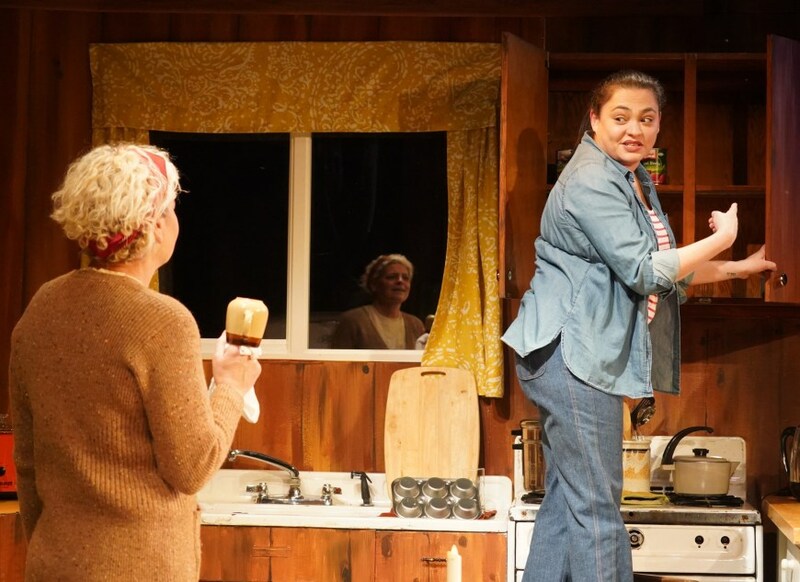 At the center of this story of highly diverse and diverting personas is the overall reserved Agnes, underplayed with incredibly powerful effects by a Bay Area favorite, Stacy Ross. Her Agnes is full of subtleties that define her strong sense of presence. Her upper lip barely lifts in visible reaction to another’s comments. Eyes often focus mostly downward when she speaks only to surprise with a direct, upward glance. Her voice tends rarely to modulate beyond monotone; but when it does, everyone notices. Emotions are controlled – until they are not. In the final scene, Stacy Ross leaves the audience limp and tearful watching her arresting collapse of all the self-control and carefully managed emotions that we have come to expect. Tracy Ward directs the Custom Made production with edge, heart, and intuitive magic. She knows how to elicit at just the right moments our laughter, curiosity, surprise (even shock), outrage, sympathy, and admiration as she milks this brilliant script for all this talented cast can give. 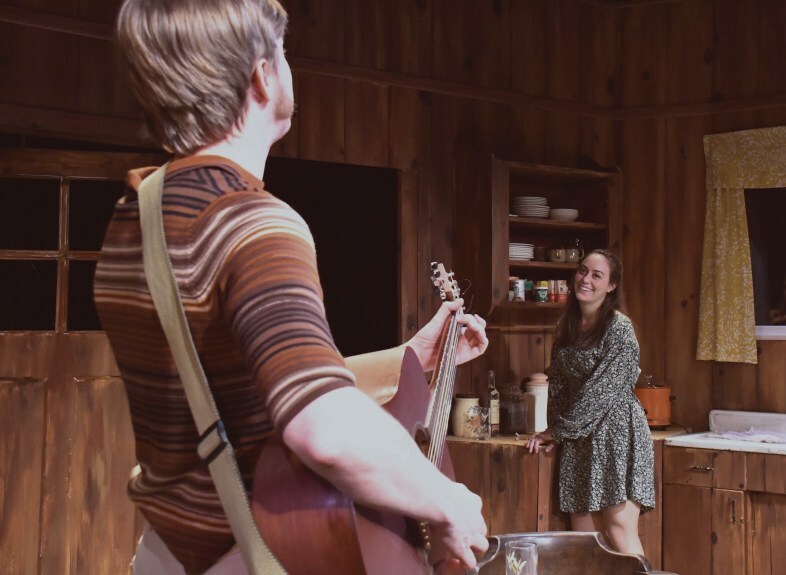 Along with Bernadette Flynn’s aforementioned scenic design, Stephanie Dittbern’s memory-lane properties and Sound Designer Jerry Girand’s choice of former 70s hit tunes (mostly women artists) establish the time period quite well. Haley Miller’s well-placed lighting decisions and Coeli Polansky’s costumes round out a wonderfully executed production team whose combined work ensure the story is authentically presented. When We Were Young and Unafraid is a story that ends on an ellipsis, not a period. We exit the theatre with a glimpse of where each character is heading but also with questions for each that hang in the air. There is another gate sound and a bell just as the lights are about to come down for a final time. Abuse of women will unfortunately continue; thankfully, people like Agnes will continue to be there to help. But one thing we know in the end of this particular story, her life and the lives of the other four have been forever altered by their joint association in the few days that we have shared with them. Overall, we leave this outstanding Custom Made Theatre production with the feeling the changes are ones that will be somehow for the good. When We Were Young and Unafraid continues through February 9, 2019 at Custom Made Theatre Company, 533 Sutter Street, San Francisco. Tickets are available online at www.custommade.org or by calling 415-789-2682 (CMTC).